Magento development companies first heard the big Magento 2 announcement back in 2015. Was this just an evolutionary step in Magento development, as skeptics wondered at the time? Or was this the quiet beginning of a revolution that would sweep across the field of eCommerce? Entrepreneurs the world over—examples include the likes of Oliver Sweeney and Devlyn—have been working with Magento agencies to build their eCommerce presence using Magento 2. The platform aims to provide new ways to enhance user engagement, make navigation smoother, and improve conversion rates and overall revenue generation for store owners. Magento 2’s user-friendly infrastructure can be conveniently operated by its users. But this is also true for any Magento web developers, which is important when it comes to cost-effective Magento customization. The new Magento 2 framework allows developers to create new services for communicating with a Magento 2 store, which in turn allows a user to interact with the store across multiple devices. Magento 2 is a highly improved and optimized version of the Magento platform. For example, Magento extension development has been made easier, so pluggable integration is standard fare for payment gateways like PayPal and Braintree or shipping methods like FedEx and DHL. In general, its improved toolchain is attracting Magento enterprise developers, and its remarkable speed is making it more appealing to end users as well. And although some might say that it’s not quite as simple to install as Magento 1, I’ve personally found Magento 2 as simple to download and install on a server as Magento 1 is. There are many other benefits that are helping convince merchants and eCommerce website development companies and they hire to make the switch; there’s no doubt that Magento 2 is a great achievement in the field of website development services. But as with many software packages, before you can benefit from it, there’s the important question of which edition is right for your business. The differences between the two are definitely worth noting. But first, what they have in common may surprise you. As its new name implies, Magento Open Source is entirely free to download and use. And as you might have guessed, the paid edition, Magento Commerce, is built on top of the free edition and thus includes all of its features. It may be free, but Magento Open Source is nothing to be scoffed at: Not only is it a great fit for many standard eCommerce businesses, even those needing some custom Magento development will find benefits in this foundational edition. Magento eCommerce developers are seeing a serious productivity boost with this version. Magento 2 provides an upgraded architecture which ultimately helps Magento eCommerce developers in creating the desired product–both the out-of-the-box functionality and any tweaks your specific shop may require. Not only that, but the new architecture is more powerful, convenient, scalable, and customizable: It was created to solve the problems faced by developers working with the original Magento 1. As a happy side effect of this, Magento development has become more accessible to developers, which means there’s a wider talent pool covering all levels of Magento customization needs. This latest version of Magento benefits, of course, from all the standard perks of being open source: Security, quality, cost, and of course, customization. Your business can easily modify or extend Magento to suit its needs with the help of website development services—you’re not at the mercy of Magento, Inc. to decide whether or how to implement a desired feature. Magento 2 gives 10 times better performance than the previous version due to a number of enhancements. Magento 2 allows sites to use full-page caching (FPC) on the server to display of all the significant categories, CMS pages, and products instantly. FPC thus reduces both server load and response time. Magento 2 has built-in FPC, but it also supports Varnish as an FPC back-end for even better performance. Special Promotions is used when running promotional campaigns. It lets you add various types of discount actions based on product price rankings, item quantities being ordered, and amounts being spent. For businesses that also have a brick-and-mortar presence, Store Locator helps users find your nearest physical store via Google Maps. The Amazon Pay extension makes it even easier for customers to pay on your site. With such extensions available, you can see how rapidly Magento website development can progress. But a Magento development agency would have no trouble creating a new extension if you happened to need functionality not currently offered in the Magento marketplace. Several improvements were made to SEO in Magento 2 to help potential customers find your store more easily when searching the internet at large for products. Magento 2 provides separate meta tags for each category, product, CMS page, etc., which helps search engines know that your site is legitimate and boost its ranking. The best new SEO feature provided in Magento 2 is the “Product Fields Auto-Generation” template, which helps define meta tags based on product information you’ve already entered. This saves a lot of time, making it painless to keep your store offering up-to-date—yet another reason why Magento development companies and their clients are attracted more toward Magento 2. The multilingual and multi-currency support provided by Magento 2 naturally help to create stores that support as wide a market as you care to target. But an interesting side effect of this support is that Magento development has gained even wider collaboration, leading to increased quality, security, etc.—in other words, multiplying the benefits of open-source software mentioned above. Every eCommerce site needs its payment methods. Some gateways like PayPal are built into Magento 2, and others are available via extensions. No matter how you get there, Magento eCommerce development is very straightforward when it comes to secure and convenient third-party payment gateways. One of the best-quality scaling solutions I’ve seen, Magento 2 automatically allows Magento web developers to resize or reframe websites according to their changing needs, making it adapt faster and continuing to provide a great user experience. In an age of ever-changing security concerns, Magento 2 was rewritten with security as a high priority, so site owners and their customers can be confident they’ll have a safe experience. Magento Open Source, despite being the free edition, has some features that perhaps reach beyond what its typical user base may be interested in. They are included in Magento Commerce, just like all other Magento Open Source features. We’ve all used sites before where a mistake in the code results in inconsistent messages being sent to the user. Since Magento 2 leverages the Knockout library under the hood, it makes it a lot easier for developers to avoid such inconsistencies while they customize Magento, giving you confidence that your website will stay looking sleek and professional. Some Magento core functionality like installation, cache and index management, and user management can now, as of Magento 2, be done via a CLI. Normally, these tasks would need to be done periodically by an admin or a developer, but with CLI, a developer can schedule a script to do this automatically, saving the developer time and tedium and saving the store owner money. Magento website developers and administrators alike know the pain of a poor backup system when something goes wrong. Magento 2’s new backup and rollback system helps in restoration of databases or files or media changes created earlier, as required. This feature offers an advantage in Magento development, as it limits any potential loss of data by providing more sophisticated backups. This helps Magento eCommerce developers to implement the design you envision instead of being boxed into the preconceived notions of your platform. Robustness is a real advantage here: Magento’s CMS can be made to look “just right” for all of your products and processes while staying lean and efficient. Large stores and eCommerce merchants are the biggest buyers of Magento Commerce because of their expandable businesses. If the above features still aren’t enough for your business, Magento Commerce is what you need. Google Analytics allows you to define additional custom dimensions and metrics for tracking, with support for offline and mobile app interactions and access to ongoing updates for your website. Google Tag Manager helps you boost and track your store’s SEO performance. Google AdWords is used to place ads (and track their results) in Google Search results and other Google products. Out of the box, Magento Commerce provides statistical reports on marketing, sales, review, customers, customer activity, products, and private sales. As always, if when your reporting needs go beyond the vast selection available, a Magento solution specialist will have no trouble filling the gap. This is a scalability advantage which has the ability to use three separate master databases for different functional areas. Checkout, order, and product data each use a separate master database that can be replicated optionally with slave databases. This separation scales the load independently among the website’s checkout functionality, order management activities, merchandising activities, and website browsing, depending on your needs. These changes provide flexibility in how the database tier can be scaled, which is a huge advancement in the field of Magento development. This allows eCommerce Store’s merchandise managers to drag and drop web content to build customized product displays in preview mode and make adjustments before applying changes on the live site. Visual Merchandiser has made Magento eCommerce website development easier than ever with its sleek navigation through categories and products. Another beneficial feature of Magento Commerce, Elasticsearch performs quick and advanced searches on products in the catalog. With this, your customers will get exactly what they are looking for, and as a result, you will get higher conversion rates. Because it returns search results based on the last generated index until the next complete reindexing cycle, there’s no disruption to customers. Plus, Elasticsearch analyzers support multiple languages, which gives a much better experience to users and Magento web developers as well. Every business has its important and valuable customers for whom they enable exclusive shopping experiences, and Magento Commerce has this covered. Best offers, customer behavior, and prompt purchases are some of the basic factors of private sales. Their configurability is a yet another great benefit attracting more Magento agencies and entrepreneurs towards Magento 2. Magento 2 provides special functionality in Magento Commerce known as “advanced admin roles.” With this feature, you can restrict an administrative user’s access to only a specific website or store and its associated data. If you have more than one brand, or business units with different stores on the same Magento installation, you can provide administrative access to each one of your business units while hiding and protecting their data from other administrators. Hence, administrators have exactly the amount of control you would want them to have within the whole system. This provides great security for your Magento development. Magento Commerce customer segments like customers, customer addresses, shopping carts, products, and sales are defined in a particular manner. Magento store developers can easily add new customer attributes and take them along to further sales and marketing processes as well as help with advanced personalization. Magento Commerce also lets you offer perks to attract customers, which directly increases the conversion rate of the site. Offering gift cards is a great strategy to grab your customers and get them to revisit your site to redeem those gift cards. Not a feature of the software itself, but nonetheless an important consideration for enterprise clients, Magento Commerce has 24x7 technical and account support available. Selling your products to customers is not sustainable until and unless you find a way to resolve any problems and issues arising from feedback; this support is a great advantage in Magento website development. As of this writing, this is also true for Magento 1. But soon, that support will officially no longer be offered, at which point this will be available for Magento 2 only. If the edition you choose later turns out to be less than ideal for your requirements, it’s easy to switch between editions. I’ve personally helped companies switch from Magento Open Source to Magento Commerce, and vice-versa, so there’s no need to worry about getting stuck with the wrong one. 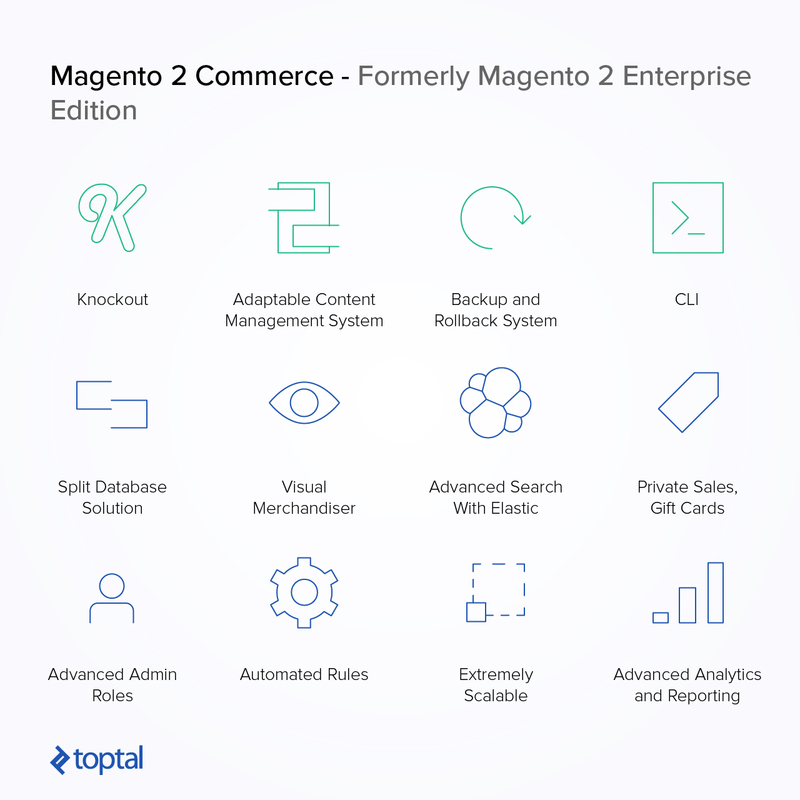 Magento 2 and, especially, its enterprise-focused Magento Commerce, is part of a great explosion of Magento website development. It’s on its way, and it will eventually displace Magento 1. In this case, it’s not just about some mundane march of progress, but because it’s actually a superior product—one that helps Magento developers deliver a better user experience to your customers and administrators alike. The quiet revolution has begun! 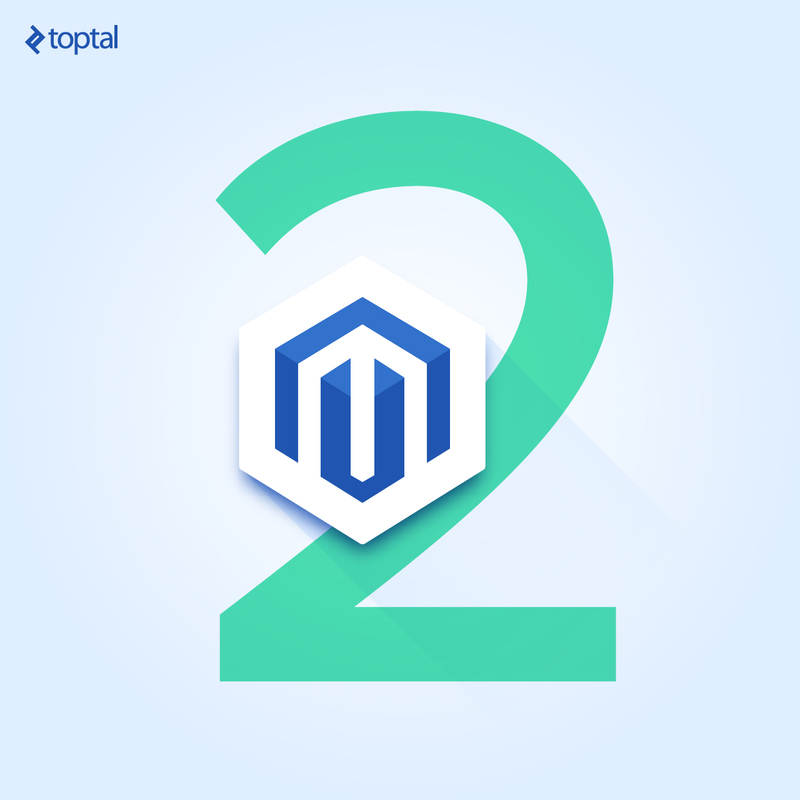 What's the difference between the two main editions of Magento 2? Magento Commerce is intended for enterprise clients and includes extra scalability, reporting, and analytics features along with 24x7 support. In contrast, Magento Open Source is free, but nonetheless is robust enough for the eCommerce needs of many businesses. Hi, Can you please explain the "Extraordinary Architecture, Extremely Scalable and Highly Secure" part. And can you provide any reference for "One of the best-quality scaling solutions" or could explain reason behind you decision to consider it "One of the best". Home › Blog › Magento 2: Revision or Revolution?